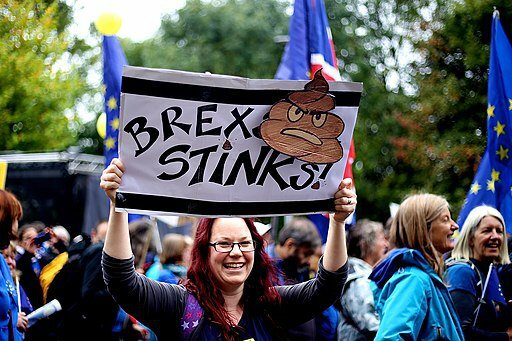 Manchester anti-Brexit protest for Conservative conference, October 1, 2017. Credit: Wikimedia Commons. CC BY-SA 4.0. On the first day of October 2018 I did something I’d never done before: I went to the UK Conservative party conference in Birmingham. The theme of the event I attended was ‘Chuck Chequers’ – a reference to Prime Minister Theresa May’s controversial plan for Brexit. It was organised by the Bruges Group, which takes its inspiration from a speech made by Margaret Thatcher in Bruges in 1988. The most quoted part of that speech was her statement that "We have not successfully rolled back the frontiers of the state in Britain, only to see them re-imposed at a European level." I went to Birmingham because, as someone who voted Remain in the EU referendum, I wanted to talk to people who voted Leave, to try and understand their position. We might not agree, I thought, but at least an honest dialogue might start to overcome the polarisation to which the Brexit vote has led. I particularly wanted to see if I could voice my concerns without getting into a slanging match. Waiting for the event to begin, I talked to a woman called Monica. Despite being part-Italian she was a Leaver believer, but the conversation started well. We identified a shared value, that of democracy, and explored the other values we held that had led us to such different conclusions. Then the speakers spoke, with applause at its loudest when Conservative MP Owen Patterson promised to vote against the Chequers plan. The Q&A session that followed included some ritual if low-key booing of a journalist from the left-leaning Guardian newspaper. As we all started to disperse, I leaned over to Monica and said that I was probably the only person in the room who had warmed to a reference to Jean-Claude Juncker, the President of the European Commission and his recent State of the Union speech. Juncker had called for a ‘pooling of sovereignty’ at the EU level. That’s where things started to go wrong. I can’t put my finger on exactly what happened, but something shifted in her body language. I had piqued her at some fundamental level. She made a remark that I heard as an assertion that this pooling would lead to a United States of Europe, and in turn open the door for a European version of Donald Trump. I’m sure that she had a much more nuanced position in her mind, but in the moment, and with everyone starting to leave, I couldn’t see a way to explore it. Despite my best intentions, I had started the slide into the kind of altercation I wanted to avoid, so I thanked her for the conversation and we went our separate ways. This preamble is by way of stressing that ‘both/and’ conversations across the Leave/Remain divide are very hard work. My organisation, Talk Shop, had already experienced this, when, in the run-up to the EU referendum in 2016, we organised and facilitated ten events around the country. They were among the few opportunities for Leavers and Remainers to meet and appreciate each other. But were there to be a general election or a second referendum I wouldn’t repeat those events. They were incredibly difficult to set up, and even with this number our small team of facilitators was very stretched. Rather, we need to find ways in which people can organise and run sessions for themselves. How could this be done? Given this interest, perhaps the best way to get people together across the Brexit divide is to draw on an American model called Living Room Conversations, which asks anyone who wants to do so to find someone from across the divide who shares that aim. The two of them co-host the event, with each inviting two other people who share their point of view. The resulting group of six meets in the home of the organiser over an agreed length of time. This approach enables people to self-organise, and it guarantees equal numbers of participants from both sides. But what would they talk about? First, start not with Brexit but with daily life. The late Daniel Yankelovich, an American pollster, wrote that, “in focus groups where those holding contrary views have been demonized, each side makes the unexpected discovery that the other is human: a kindred soul who laughs at the same jokes and has similar worries.” In a dialogue in the city of Srebrenica in Bosnia-Herzegovina between Serbs and Bosnjaks (Muslims), for example, a Bosnjak man started by complaining about having to drive his daughter to school because of stray dogs. Almost everyone in the room, it turned out, had a story to tell about the same dogs; people started to realise that they lived in the same world. The group could then use these joining points to explore their implications for the future relationship between the UK and the rest of the EU. In doing this, they might also bear in mind that people can support the same outcome for different reasons. A citizens’ income, for example, is supported by many people on the right to reduce the size of the state, and by many on the left to tackle poverty. In the children’s programmes of my youth like Blue Peter, some hair-raising stunt would be preceded by a caution: “Don’t try this at home.” In this case, please do.